Enterprises today are spending $12 billion each year on customer relationship management (CRM) systems worldwide according to Gartner Research. But far too often, these complex CRM systems are underused. This is often due to the difficulty involved in leveraging the power of CRM in the field by the sales executives and managers. Fortunately, CRM is being revolutionized with the help of mobile technology. iOS and Android today have changed the entire way enterprises communicate through various smartphones and tablet devices. This has led to an increase in many third-party mobile CRM apps, helping mobile agents access contacts, take calls, send emails, set up tasks and even browse prospects’ social feeds, all while automatically logging activities and syncing contact changes in CRMs like Salesforce.com, Microsoft Dynamics CRM, SugarCRM, Zoho CRM, and more. This mobile CRM application is compatible with iOS devices, like the iPhone and iPad as well as with Android. One of its main features includes easy access to customer data on the go. Customer addresses can be traced on Google maps and information can be updated without the need to sync with any other device. It also has a Twitter connector and a feature to connect with other social networking apps to share relevant content. Not the best rated on app stores, but still one of the best ways to tap into the SugarCRM ecosystem. 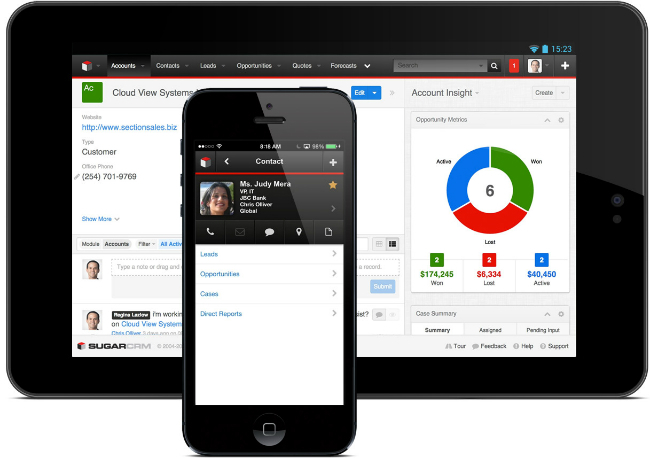 This mobile CRM app is one of the best CRM apps in the market today. Apart from the core features of a CRM, it provides features similar to popular social networking sites using Chatter. 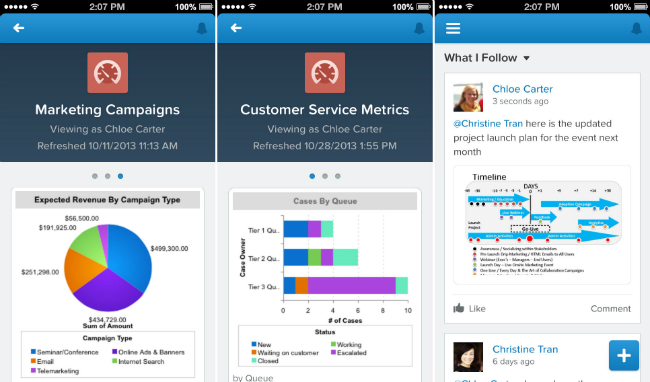 Being a cloud-based CRM solution, the entire setup can be accessed through the Salesforce1 Mobile app. Many organizations using the app claim that it has helped in increasing productivity and reduced the need for emails and meetings. Sales reps and executives can update each other in real time about any opportunities, allowing staff to take action in quick time. If you are willing to fork out the high fees to use it, then you can’t go wrong as this is the benchmark against which other Mobile CRM apps are measured. Ideal for small businesses, this mobile CRM app is available for both iPhone and Android users. It allows enterprise users to browse through reports, check the availability of inventory, process pending approvals, receive important alerts and access customer-related information in a jiffy. 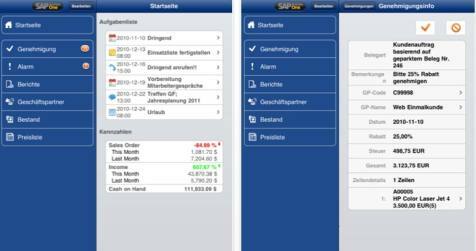 This app is definitely the optimal choice for firms with SAP as their backbone. Right from sales, claims, surveys or inspections, employees in the field can use mobile CRM applications to provide top-notch experience in almost every customer-related situation. There are lots of options available in the mobile CRM market like Microsoft Dynamics CRM mobile. 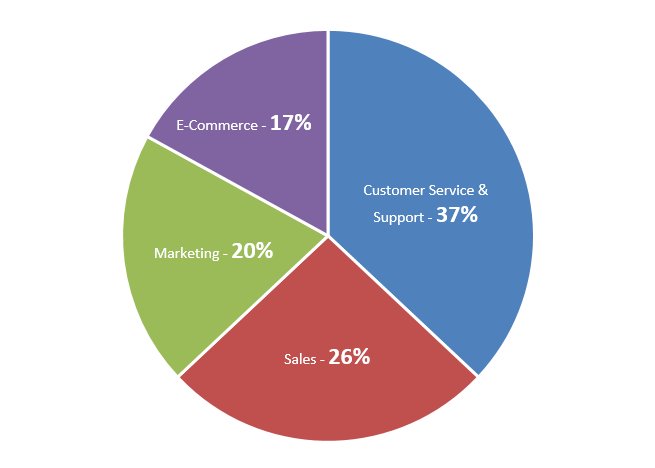 The three mobile CRM apps mentioned above are majorly used among enterprises. The best way to select the ideal mobile CRM app is to begin analyzing the options, allowing you to see what features are most important to you. A little warning if you go browsing for apps on your own – it is very important to make sure you pick an app that has been used and reviewed by other people. Apple iOS is pretty strict about security and developer access to your data, however, the Android marketplace can be a very risky place to randomly download an app that has not been well-reviewed and downloaded. You would be surprised on just how much data access you can inadvertently give an unknown source. Rishabh Software has experience in building and integrating mobile CRM solutions, helping global clients to achieve their business goals. Some of the mobile CRM solutions that can be developed are: Custom Salesforce CRM solution with mobile integration, Custom Dynamics CRM solution with mobile integration, CRM mobile integration and cloud integration, mobile CRM customization, Native mobile CRM app or Cross-platform mobile CRM apps. If you are looking to develop a mobile CRM solution for your enterprise, talk to our experts at 1-877-RISHABH (1-877-747-4224) or fill in the contact form to know more on our mobile app development services. Best Option for Enterprises: Mobile App or Responsive Design?